I am back at the ESAV in Marrakech for another week of type education with the second year students in the Laboratoire Expérimental de Typographie Arabe. During my first week in March we worked with stencils, as I described briefly in this earlier post. However, the stencil work, chosen to add a manual component to the often digital-heavy process of current typographic work, remained a preliminary step of the workshop. The second aspect and final brief were an artwork that combined both, manually crafted stencil artwork and digital typography. 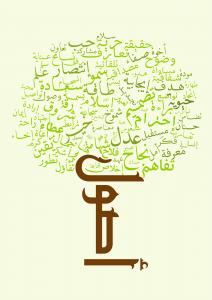 More precisely, the class was encouraged to submit their works to the WinSoft Arabic typography competition. This detail was obviously left out of my earlier post to avoid influencing jury or public voting. The attentive observer of Arabic typography might have followed the contest’s development and the announcement of the winners a couple of days ago. While I congratulate all winners and most notably the first prize winner Dareen Najjar Khoury, I am particularly delighted about the fifth place’s winners: Amine Mohamed Tahour and El Mahdi Ait Lmoddan. Amine and Mahdi are two of my young and utterly motivated students from the ESAV in Marrakech. It is obviously very rewarding from a teacher’s perspective to see such immediate returns: two second year students of a very young design school (they will be the first graduation of the ESAV) win the fifth prize of an international design competition that does not distinguish between professional and student submissions. Quite a feat! Mabruk! And while such an achievement can never be linked to one single influence, I still am very pleased that we were able to get this far during my first week of teaching in Marrakech and albeit the slightly improvised conditions of this workshop (the Tasmeem software, a prerequisite for participation, was only installed on the second last day of teaching). Of course it remains to be seen whether this is a one-off event, or if it will turn into a series of comparable successes. But for the time being we can look forward to more work from the students of the ESAV Marrakech. Without a doubt, this prize makes for a strong signal from an emerging design school in the region which promises to contribute significantly to the developing Arabic design field. Personally, I certainly hope for this to be but a first step, and will work on its continuation this week, and many more to come.